I’m currently about a month behind schedule, though. I believe in plans. If I’m going to make a go of writing as a career—something I want very much—I have to have a plan, because going about it haphazardly will likely lead to me living in a cardboard box under the Manhattan Bridge. But life. Oh, how life intervenes sometimes. I figured I’d take a little time out to talk about some of the all-out insanity of the last few months and what I’ve got on deck, partly to explain my occasional absences from social media and to let you all know what I’m working on, and partly just to write about it. This is a long post, but I hope you’ll read to the end. I buried the lead on some news. • My non-writing career stuff got complicated in 2014 when the company I work for by day laid off half its staff in the spring. Figuring I’d probably get laid off in the fall, I hung up my freelance shingle again in July. For those of you who don’t know, I’ve worked in publishing for years and have long done editorial freelance on the side, but I’d taken a two-year hiatus to focus on writing. Well, as soon as I hung the shingle, I got two regular clients, which was great! Financial security is always good! But they kept me BUSY all through the fall. And then I didn’t get laid off after all. So mostly I just worked. A lot. I need to make some changes in 2015, and I will, though my plan is not concrete just yet. • Personal: My uncle, my mother’s brother, passed away in December after a long battle with cancer. I’d been mentally preparing for this for a while, but everyone thought he had a few more months left, so it still felt sudden. I went down to visit family for a week, which was nice but also incredibly sad. He was a really great man. 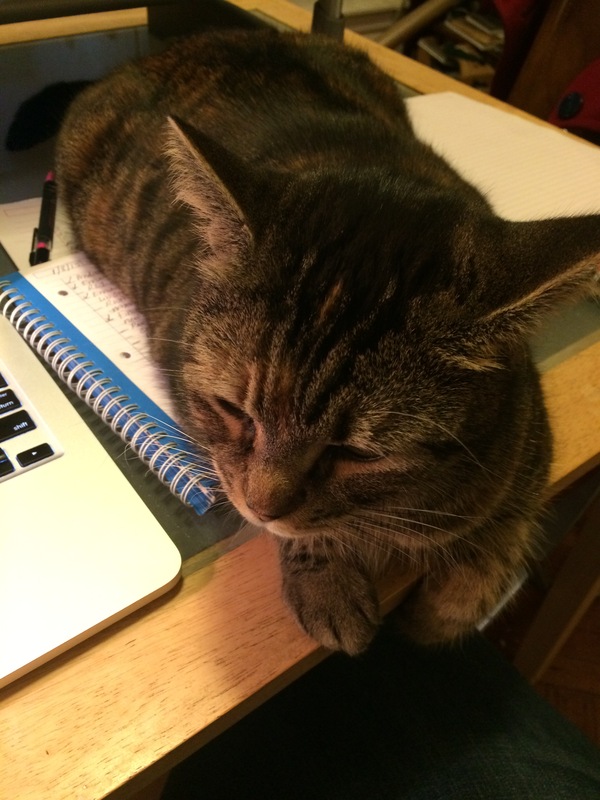 New cat, keeping my writing notes warm. My mother has been having a difficult time with things—not just this but a bunch of other stuff, too—so I spent a lot of November and December with her. She’s getting ready to move out of her apartment and probably out of New York for at least a little while, and so her cat has moved in with me indefinitely. So now I have two cats. Which is why my Twitter is kind of All Cats All the Time lately. The family stuff and the cats and my freelance work schedule all hitting at the same time was really tough. It was also an opportunity to put things in perspective. I’ve seen a lot of the flame-outs and community drama on social media recently—side effect of sitting at a desk all day and having a short attention span, I guess—and I understand how easy it is to get caught up in it, but I also decided over the holidays that I was going to blow off the Internet and spend time with family. My uncle’s passing brought home for me that my parents are aging and won’t be around forever, so I should make more time for them, for example. I want to make more time for what’s important to me, which is primarily my family—both biological and chosen—and my writing. So that’s where I’m focusing my energy right now. 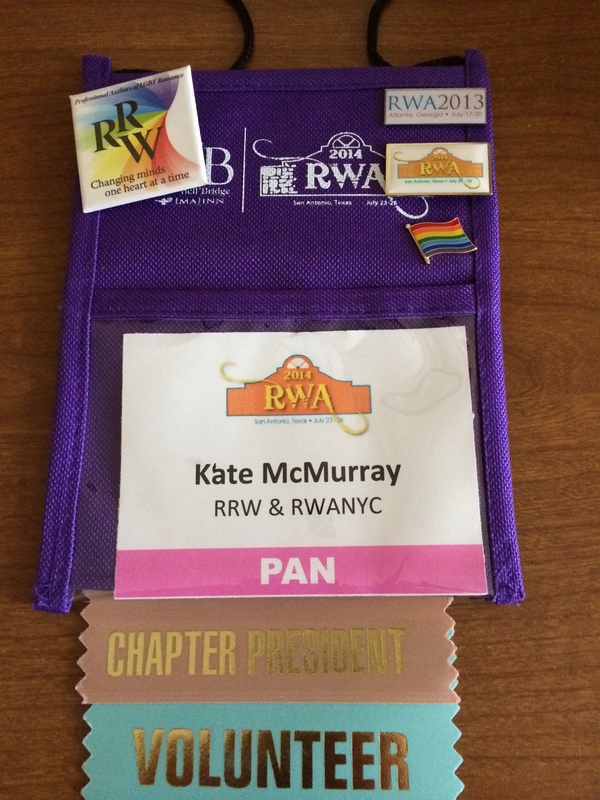 • Other stuff: I just finished out my year as president of Rainbow Romance Writers, but in the meantime got myself elected to the Board of the New York City chapter of RWA (as vice president of programs). So I’m doing that, too. • An obvious highlight in what was otherwise a completely crappy December was the release of When the Planets Align. I spent the week before its release in Georgia with my family, so it felt weird and a little inappropriate to beat the promotion drum too loudly under the circumstances. Still, I got a lot of the blog tour stuff written before I left for the funeral, so I hope people found out about the book. This is a challenging book. I predicted critical response would be mixed. The story is told nonlinearly. When I was about halfway through the first draft, I ran into a post on Facebook that was basically, “These are all the romance tropes I hate the most!” and Planets includes almost all of them. I wasn’t at all sure how the Joan character would be received, because she’s not really a villain but she is an obstacle between the characters and their happily ever after, and she was really hard to write. I’m glad to see reviews are mostly favorable, but I also recognize this is not a book for everyone. I hope those of you who do decide to buy it enjoy it! I’m working on first edits now for Book 1. It’s called The Windup. This is the rare book where I, uh, hit it out of the park in the first draft. (Sorry, expect a lot of baseball metaphors in 2015.) I often do a lot of rewriting and adding and moving when I revise—and I love revising, I really do, I think it’s the editor in me—but The Windup went to the publisher polished and trimmed but not substantially different from that first draft. It’s good, I think; I like this book a lot at any rate. I paired up a character who suffers from an anxiety disorder but is open about his life and his flaws with someone who is cool and outgoing but keeps his emotions and anxieties close to the vest. So they have to find some middle ground. While playing baseball together. I threw up a placeholder page for the series that will contain more information and some fun stuff starting in the second half of February. I’m aiming to launch some of the preliminary stuff starting the week pitchers and catchers report for MLB duty. The first book is scheduled to come out in April. 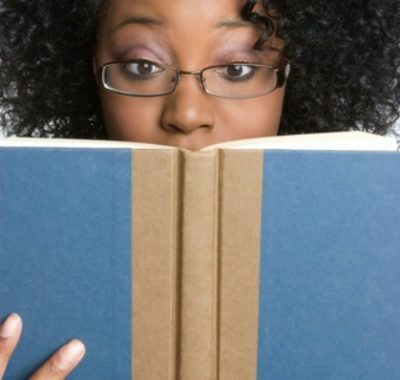 • What of the other two books I mentioned? Well, those are first drafts, which means they still need to be put through the revision wringer before I’ll call them finished manuscripts. The first, a new adult novel that is kinda sorta but not really a gay-for-you story, is almost there. The second, a historical set in NYC in the Gilded age and already contracted with Kensington for 2016, is waiting for my attention in the queue. I haven’t looked at it since I finished the first draft in early December. So those are my immediate next projects. • Today I also plan to start reading The Boy Next Door for preparation to finally, finally write the sequel for Neal. It’s in my six-month plan and everything. I mean it this time. Note that TBND is about to come out of contract and will likely be out of print for part of this year, but hopefully a shiny new edition will be out soon. Stay tuned for more info on that. • I have a couple of other books I want to write this year, so the good news is that there will be more Kate stuff for the foreseeable future. The weird thing about being in charge of something is that you do a lot of work that nobody sees. You gotta pimp out your badge before you get started. I can say, though, that I got a lot out of the conference, and I left San Antonio feeling really inspired and excited. I feel re-energized to tackle my position as RRW president. I’ve got a short list of things I’d like to accomplish during the rest of my tenure. 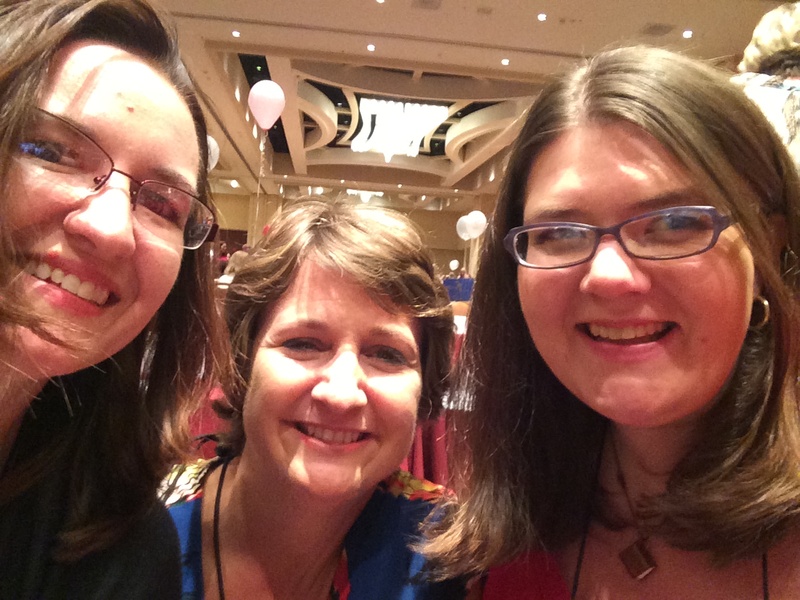 Tara Sue Me, Jennifer McQuiston, and Yours Truly take a selfie before the literacy signing. I do a lot of signings with these ladies because of the alphabet. I did the Literacy Signing this year. It went okay. I wore my dress that has a print of comic panels showing people kissing, and really, where else are you going to wear a dress like that? There were only two other gay romance writers signing that I knew about (Ally Blue and LB Gregg) which made me wonder why there was such a low LGBT romance turnout this year. Was it Texas? I attended fewer workshops than I intended to because I kept having schedule conflicts, but some highlights for me included the chat with Nora Roberts; a panel discussion on romance and feminism with Lorelie Brown, Tessa Dare, Carrie Lofty, Zoe Archer, and Julie Leto; and a panel on book marketing with Barbara Vey, Eileen Dreyer, and Maggie Mae Gallagher. I liked Sylvia Day’s keynote speech; not as emotionally moving as Kristan Higgins’ speech from last year, during which I cried for real, but still inspiring. At one point I looked around and felt such pride and awe to be surrounded by all of these smart, successful women. I got to fangirl quite a bit. I think maybe one of my favorite single moments of the conference was going up to Mary Jo Putney at one of the publisher signings. She asked which chapter I was the president of, so I told her about Rainbow Romance Writers, and she said she was really happy with how the definition of romance has expanded to be more inclusive. We chatted about gay romance for a few minutes and I tried not to be too much of a dork. I mean, Mary Jo Putney. She’s one of the elder stateswomen of the genre and I’m such a fan. That was a recurring theme of the conference. They gave me a Chapter President ribbon to wear, so people kept asking me which chapter I was the president of. Every single person had a positive response. Many told me they were glad RRW was doing the work it does. I had a lot of people tell me about the LGBT activism their siblings or children were involved with and that sort of thing. So that was pretty great. 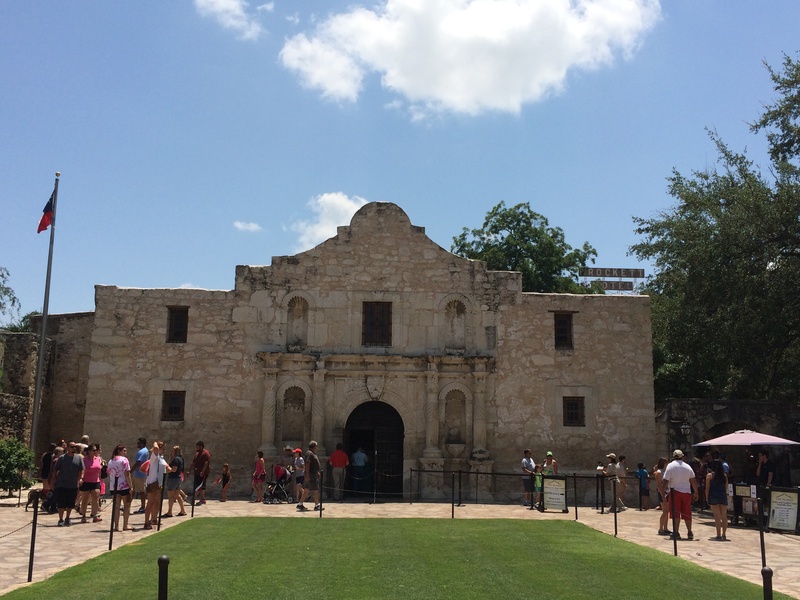 I remembered to visit the Alamo! I even got to see a little bit of the city. I had lunch free Friday, so I walked to the Alamo, only about a block from the hotel. Friday night, I met with an editor from a French publisher to talk about gay romance, and we took a walk on the Riverwalk to a bar that was a fair distance from the hotel. It was a really nice walk. San Antonio is a cute city. I would have liked it even better if it hadn’t been so hot. So that, briefly, was my RWA experience. I can’t really begin to convey how great it all went.